The "Photographing the Beauty of the South Shore" exhibit had a wonderful opening today. Many people attended the exhibit. They saw many beautiful images of many beautiful parks. I would like to thank all of the cultural councils that provided grants to make the workshops possible. Thank you also to the many photographers who attended the workshops. I especially want to thank all of the photographers who submitted their images to the exhibit. Your work truly made for a wonderful collection of photographs! Special thanks goes to John Galluzzo who set up many of the workshops and applied for all of the grants. Of course the staff and volunteers at the North River Sanctuary were fantastic! Finally, I would like to thank Cynthia Brown, who I presented with a certificate of appreciation and one of my snowy owl images ("On the Fence" http://blog.greglessardphotography.com/2012/04/on-fence.html) for being an outstanding workshop participant. She not only attended every workshop, she would often present us with history and botany lessons about the parks we visited. My favorite lesson was about the sweet pepperbush, which can be used as a soap. With her help we learned how to add a little water to the plant to turn it into soapy bubbles. It was very interesting! 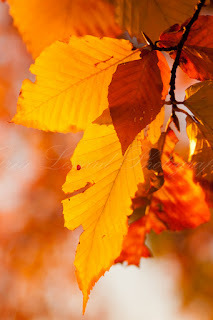 The other image in this post is my favorite of the Beech leaves that I photographed while Cynthia was photographing me. 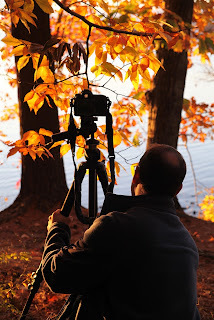 Thank you again to everyone who participated in or supported "Photographing the Beauty of the South Shore"! Lovely "dyptich" you created with Cynthia's wonderful image and your own image Greg. Although I didn't attend as many of the workshops as I would have liked, the ones I did attend were excellent. It was a pleasure to meet the other participants, especially Cynthia who you mention here on this blogpost. She is a sweetheart for sure. Congratulatons on this successful project! Thank you Carol! It was great to see you and your images on Saturday!